At Sydenhams we stock a range of renders for most building purposes. K Rend is the UK’s largest independent pre-mixed silicone render manufacturer. The K Rend silicone renders form an attractive range of one coat applications which can be plastered directly onto blockwork. The range incorporates water repellents as an integral part of the cement based render system. The water repellent surface ensures a freshly rendered appearance for a prolonged period. The finish is drier and thus more resistant to algae growth and the natural phenomenon of limebloom. K Rend Renders are available in a range of colours and finishes. If you are looking for a smooth or deliberately textured surface, then rendering will be what you are looking for. 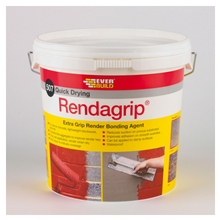 We stock high quality, ready to use rendering products from Everbuild, that boasts fantastic extra grip render bonding agents. They contain fine aggreagate to provide an improved mechanical key, and reduces water suction on highly porous substrates like blockwork. This can be applied to wet surfaces and is waterproof in the most extreme condition. Come into branch to see our stock and to get any advice you may need, we are always happy to help.